Welcome back to Year 1! We hope that you have had a great holiday. We have been impressed with how well the children have managed to quickly settle back into class. In IPC, we will be starting our new Topic ‘From A to B’. This topic will focus on different modes of transport and will look at migration of people around the world. Later in the term, we will be visiting the Water and Steam museum in Kew, during which the children will be able to ride a model Steam train around the site. There will be an exciting Exit Point involving parents and we will be creating our very own Old Oak ‘aeroplane’ for the day! The children will be able to use their class passports to journey around the world. Blue Planet… in the Savannah’ By Ella Bailey. This book is full of factual information about tropical animals and their natural environment. The RSPB will be working with the class to explore local habitats. The children will continue with their Guided reading carousel every morning and will now receive additional Phonics sessions in streamed groups. In Maths, we will be learning to count up in 2s,5s and 10s and we will be continuing to develop methods for addition and subtraction to 20. We will continue with place value within 50 and we’ll begin to measure length and height. We are looking forward to the fun activities planned for this term, it has been a joy to witness their progress so far, we’re sure this term will be just as exciting! Olive class enjoyed Diwali celebrations this week. The class celebrated by learning hindu dancing, dressing up in Sari's and food tasting. In English they looked at reasons for and against forgiving Goldilocks for entering the three Bears cottage. They also visited the life bus and learnt about the human body. Welcome to Year 1 and Keystage 1! We have been impressed with how well the children have managed to quickly settle and adapt to new routines. The children have embraced being put into different classes and have been making a big effort to build new friendships within the classroom. In IPC, the children have been introduced to the personal goals (Co-operation, resilience, communication, morality, enquiry and respect) and have enjoyed acting out examples of each of the goals. We have also been studying seasons and looking at changes with the weather. In English, we have loved reading the book ‘The Blue Penguin’. This book focuses on friendships and we have been making links to our own experiences through discussion and roleplay. Recently, we took part in a sensory carousel involving the Arctic and the children were able to independently work through the activities and use their senses to generate vocabulary for poetry. During these sessions there have been lots of opportunities to work collaboratively in shared writing. We look forward to hearing the children’s individual poems at a later date. In Maths we have been looking at reading and writing numbers using numerals and words. The children recently took part in a Maths Carousel centred around counting. Activities included: giant number block building, large water foams, number bottles on a wall, number dot-to-dot, wooden number counting and matching amounts. The children were able to guide themselves around the activities and were able to take turns and co-operate with little support from the adults. We have been pleasantly surprised with how the children have coped with the transition and we look forward to witnessing their progress and development in the coming year! As part of Olive Class’s IPC unit this term the children have been learning all about our Active planet. As part of our entry point we had to think about what we would do if an earthquake was to occur whilst we were in the classroom. We then put our thoughts into practice during an earthquake simulation. In groups, we created Relief Centres and prioritised important resources that should be provided to victims of earthquakes. As part of their home project, the children created their own volcano models and in class we were able to create eruptions using vinegar and bicarbonate of soda. The children enjoyed visiting the Natural History Museum and were able to take part in an interactive show about Volcanoes and Earthquakes. They then looked around the Volcanoes and Earthquake exhibit which included the artificial earthquake model of a Japanese supermarket complete with shock simulations. 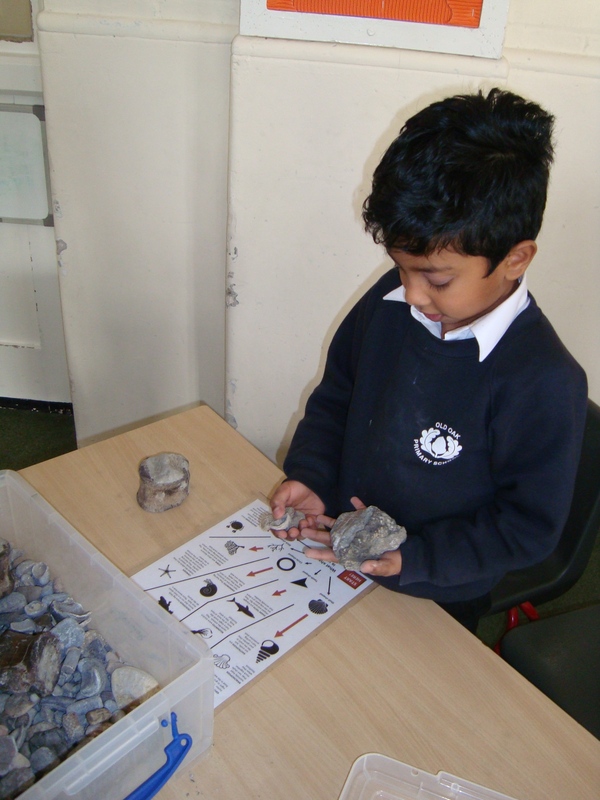 The children have also enjoyed learning about rocks as part of the Active planet curriculum, next term we will be making further cross curricular links with our Power of Reading text Pebble in my pocket. This term, the Year 3’s have been studying ‘Footprints in the past’ as part of their IPC Topic. The children enjoyed pretending to be palaeontologists during their entry point and this week the children were lucky enough to meet a real life palaeontologist. 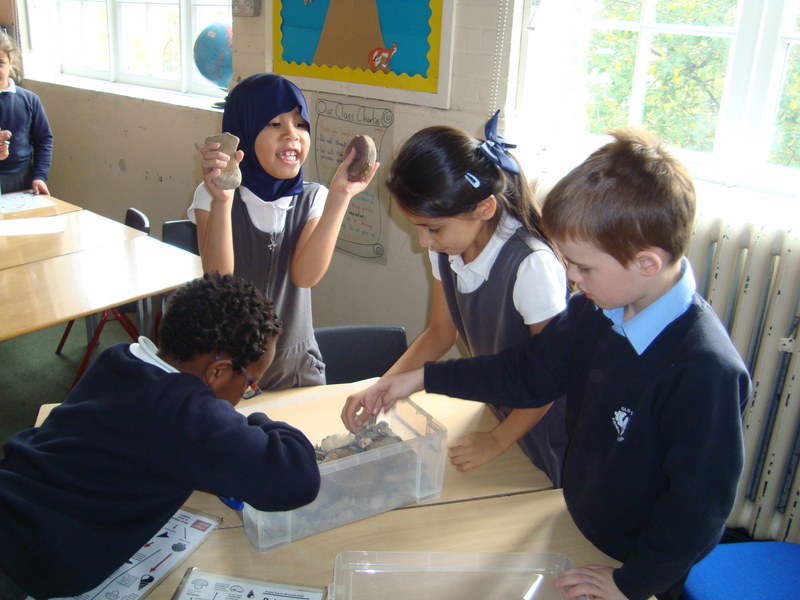 They had lots of fun finding out about the process of fossilisation and enjoyed rummaging through real fossils. 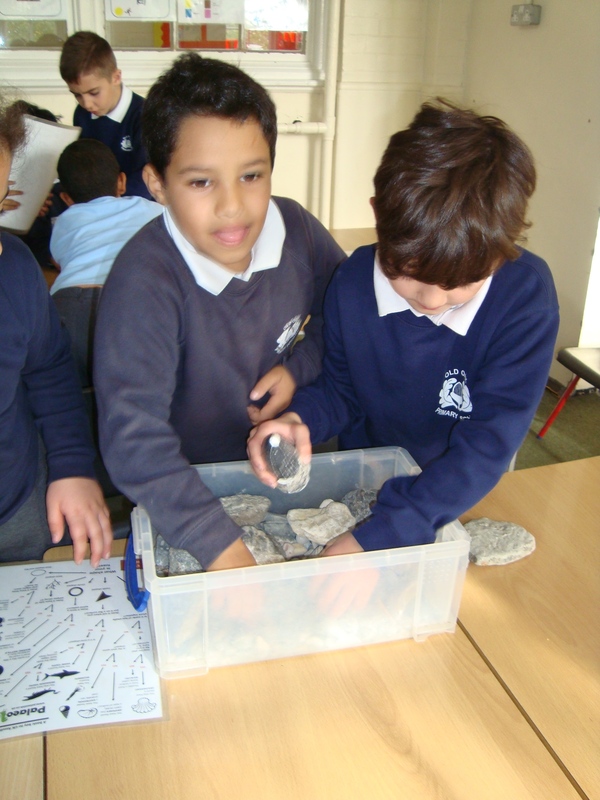 The children discovered belemnites, ammonites, trilobites and much more. They also discovered tiny creatures in the pieces of tree sap and amber. Jules, the palaeontologist was amazed by how much the children knew about the Jurassic period and was impressed with the level of questioning. The children are looking forward to creating their very own Natural History Museum as part of their exit point and showcasing their work and knowledge to family and friends.